It is a wonderful sunny day here and I wanted to post a sunny card to celebrate! 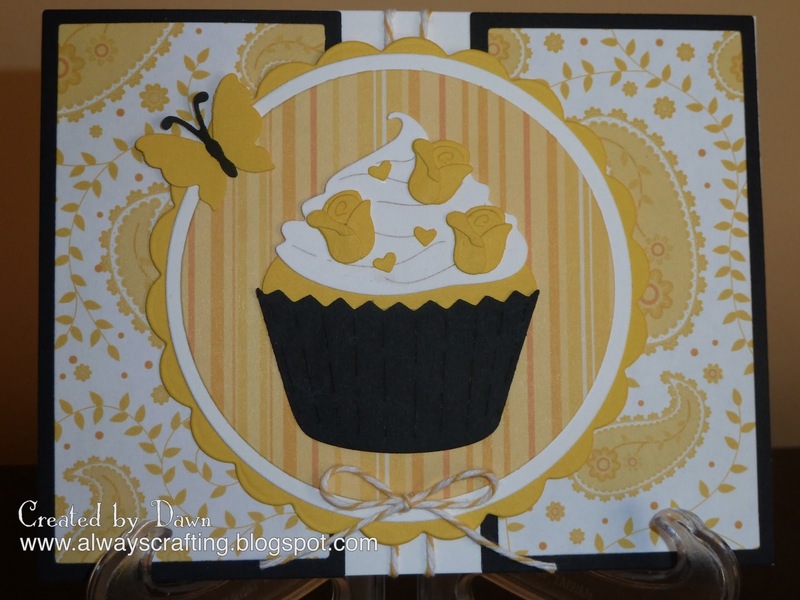 Here is a card made with a die cut from my very talented friend Emma's cupcake die. You can get the die here. Her dies are called "Buggy Designs by Emma". Check them out! Yum!!! :) Thanks for playing along at Cupcake Inspirations! Your die cut is fabulous! Love your yellow black and white scheme. Thanks for joining us at SSW! Great cupcake, it is very cute! Thanks for playing at Craft Your Passion! Oh I love this cupcake Dawn! Such a clever work of diecuts. Beautiful papers and great take at the sketch. So glad to have you join us at Sweet Sketch Wednesday. I do hope you'll return again in future challenges too. I love your cupcake die. Such a cute card! This looks yummy - it is nice and sunny here too - about time !! Now that is the prettiest cupcake I have ever seen! Thanks so much for playing at Sweet Sketch Wednesday. yummy...this is fab. Thanks for joining us at Paper sundaes this week. Hi Dawn that Cupcake looks good enough to eat yummy. Great colours and design papers. Is is Banana or Caramel and Chocolate looks good. Thanks so much for sharing your card with us at Sweet Sketch Wednesday this week. Lovin' your bright, cherry splash of yellow! Scrumptious-looking cupcake, too! Thanks so much for playing along with us, this week, in The Cafe! 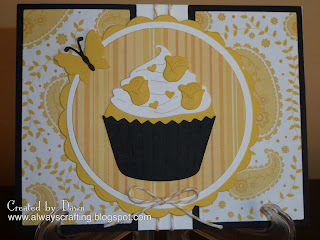 Oh beautiful color combo and your cupcake die is great!! Thanks for playing at SSW! What a darling card. Love that sweet cupcake. Arlana@SSW!! What a super cute card! Love the cupcake! Thank you for playing along with Cupcake Inspirations! So cute! Thanks for joining us at Cupcake Inspirations this week!